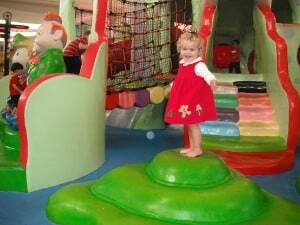 UPDATE: There is a NEW playground at the Memorial City Mall. Read about it HERE! My kids and I are always up for an adventure, and the latest one took us to… the mall. Yes, really. We spent several hours at Memorial City Mall and did not do any shopping at all. Memorial City Mall has an ice skating rink, a double decker carousel, a train, a model train museum and a free play castle. My kids started at the free play castle. 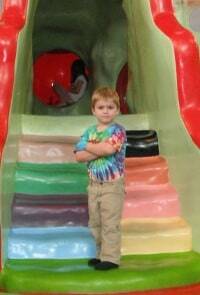 Usually I do my best to go around mall play areas and just pretend they do not exist. They are crazy busy and you can practically see the germs crawling around. At Memorial City Mall, the castle is giant and is right in the middle of the mall. There is no getting around it, and I’ve learned to like it. The castle is in a closed off area with only one entrance with a security guard watching who goes in and out, making sure there are not too many children, and turning away kids that are too tall to play. Everyone, including parents, takes off their shoes and there is hand sanitizer at the entrance (which I soak my kids with every few minutes). The big kids have a great time. They climb the stairs and bridges and go down slides. Since it’s closed off, I don’t feel the need to chase my kids everywhere they go. Even James liked kicking on the mat. Right next to the castle is a place where you can rent those cool car strollers. They cost $5.00 and you get $1.00 when you return them. I’m not willing to give $5.00 for a stroller ride, so my kids always ask for them and I always say no. That said, today was our lucky day. As I was trying to pull Brooke away from the car strollers, a lady was coming back to return her stroller. She offered the stroller, so I gave her $1.00 (which we later got back when we returned it) and we were on our way… making it the best mall trip ever. 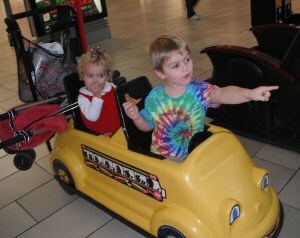 We drove our car cart over to the carousel in the food court. It was closed for a short break, so we grabbed some Chick-Fil-A… and I don’t think you can ever go wrong with Chick-Fil-A. I was also happy to see that McDonalds next door had the $1.00 large drinks and grabbed an iced tea. 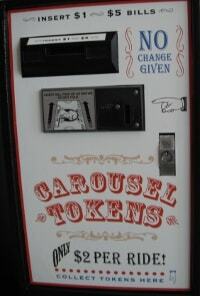 Back at the carousel, you buy your tokens at the machine. 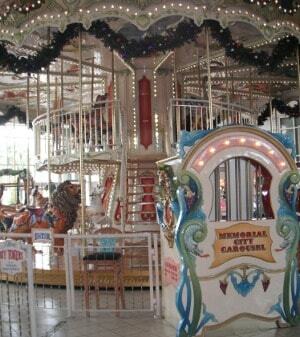 The rides cost $2.00 each (but parents can ride for free next to their child). 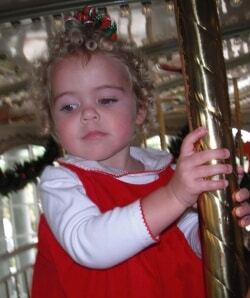 I wasn’t thrilled about the price, but we go two tokens and headed up to the second story of the carousel. Brooke wasn’t so sure about being up high at first, but the kids decided it was pretty cool. After riding the carousel, we got two coupons for free chocolate chip cookies at Great American Cookies. We drove our stroller car back near the play castle and got our cookies. This made the $2.00 tokens more tolerable. I should also add one of my kids favorite parts of the mall. In the family bathroom next to the food court, there is a kid sized toilet. Really. I Lysol-ed the heck out of it (yes – I have a travel size bottle) and my kids thought all bathrooms should be so neat. I’m not sure if they can compete with the family bathroom, but the mall has a few more things to do. 🙂 If you go while they are open, there is a small model train museum near Target. It is a hobby club, and has limited hours that you can find HERE. The Houston Tinplate Operators Society (HTOS), is an organization of O-gauge train modelers whose principal interests range from true tinplate (pre & postwar) to near-scale 3-rail operation. My kids have been a couple times in the past and always ask to go back. It’s just difficult to hit it while it’s open. Memorial City Mall also has an Ice Rink. Go HERE for the website. They offer free skating, shows and classes. Near the ice skating rink is the train depot. The train, on wheels, goes on a big lap around the mall. Last time we rode, it was $3.00 per person, including the adult. Since that adds up to a big number for us, I usually avoid it. 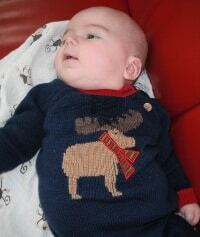 That said, for a special occation, I’m happy to take the kids and they love it. Thank you! Very great info, love that you list pricing and exact locations in the mall! Thank you. Will be good for rainy and HOT days!